Why Genealogists Should Care About Trump's Agenda - who is nicka smith? 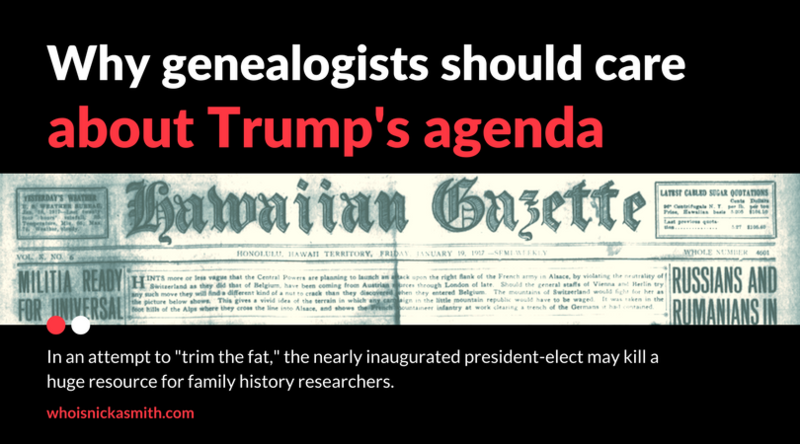 In an attempt to “trim the fat,” the nearly inaugurated president-elect may kill a huge resource for family history researchers. I could go on and on about the election, but alas, we’re here and tomorrow, January 20, the 45th president of the United States is going to be sworn in. The last few weeks have been tumultuous, regardless of where you sit politically. From almost unbelievable hearings on cabinet selections to allegations of collusion by foreign powers, recent events have made for “a time in the land” as my grandmother would have said. A huge benefactor of grants provided by NEH is the National Digital Newspaper Program (NDNP). This program was initially established as the United States Newspaper Program (USNP) and “was a cooperative national effort among the states and the federal government to locate, catalog, and preserve on microfilm newspapers published in the United States from the eighteenth century to the present.” (2) USNP was a collaborative effort between NEH and the Library of Congress. The NDNP took the place of the USNP once it ended in 2011 and when preservation and access moved to digital means. More than 63 million pages of newspaper were microfilmed as part of USNP (3) and 11,536,946 pages are digitized and available on the NDNP website as of today. You’re probably thinking “What is the NDNP website and how can I get access to it?” 9 times out of 10, you’re probably already using it. It’s called Chronicling America. Yes, our mainstay for free access to newspapers. Our awesome resource that helps fill in the gaps during that Black Hole time period. The can’t get any better newspaper directory for nearly all 50 states that spans from 1690 to present and includes holdings information on where to obtain copies of papers across the country. The amazing resource that was gifted with MILLIONS of dollars from our federal government or really millions of dollars from the both me writing this and you reading if you’ve paid federal taxes like I have. 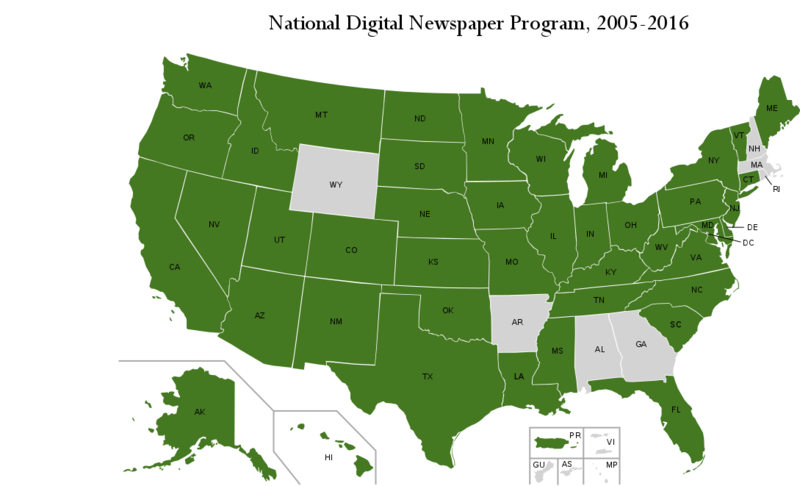 “National Digital Newspaper Program, 2005-2016 (Map).” National Digital Newspaper Program | Library of Congress. Library of Congress, 03 Nov. 2016. Web. 19 Jan. 2017. <http://www.loc.gov/ndnp/>. In my opinion, obliterating the NEH means removing the funding that drives Chronicling America and thus ensures that the site will not continue once the funding is cut. Use Existing Channels – As a community, we can use collective efforts such as the Records Preservation and Access Committee (RPAC) to alert our community to a potential issue. Monitor Voting – As citizens, we can stay vigilant monitoring the activities of Congress by paying attention to issues that come up for vote (Click here for the Senate and click here for the House) and checking in on our elected officials regarding how they are voting on issues. Contact The DC Office – Click here to gain access to contact information for your Senators and click here to gain access to contact information for those working for you in the House. I’ve been told that calling their DC instead of the local offices is the best bet in reaching a human and making waves. Tweet – Click here for a Twitter verified list of those in Congress. I’ve seen contact on Twitter create some pretty big changes recently, so don’t rule it out as a tool. What do you think we can do to make sure funding isn’t cut to one of our most beloved record sets? Sound off below.